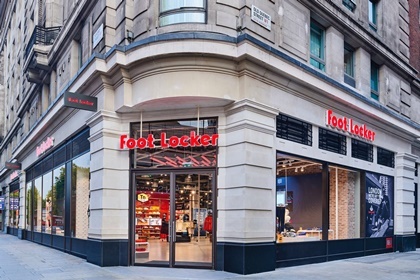 Bridgford Interiors deliver a new Power Store in London for Footlocker providing an immersive retail experience. Situated beneath the historic Cumberland Hotel near Marble Arch on London’s busy Oxford Street the store has been designed to inspire and provide a tech-filled experience for consumers with a strong focus on presenting premium products. The 647m2 of retail space across three floors uncovers local architectural heritage of the site and blends it seamlessly with ‘London – We’ve Got you Covered’ digital brand messaging, the iconic red locker wall and cultural wall art by Tommy Bates.